One of my completed Steiner Stamp Album Pages. This is page 19 from the Czechoslovakia 1969 album. 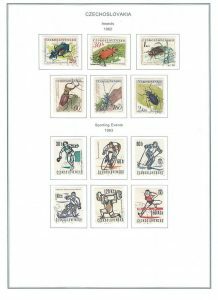 It depicts the 1962 Insects and 1963 Sporting events. Just a simple blank page with a nice border around the edges. Just click on the above image to do to a Full Size Preview and download of the PDF version.